The Mughal gardens are open to the public in the month of February-March every year and specific dates, times are announced every year. Visitors are allowed entry to the garden on all days except Mondays. Timing is from 10 AM to 4 PM. The gardens may remain closed on other days also in case of a function in the Mughal gardens or during the visit of a VVIP during the said period. The dates are made known to the public through various media. The entry and exit into the gardens is regulated from Gate No. 35 of the President’s Estate, which is located near the North Avenue, at the western end of the Church Road. On an average over 5 Lac visitors the Garden every season – weekends are jammed , and its always better to go during weekdays. There is no entry charge, no way to reserve a ticket – and you walk past two levels of security. The male / female Q’s are separate and you meet at the entry of the garden. No bags / purses / cameras / Food Items are allowed – all you can take with you is your cell phone & wallet. We left our stuff in the car – but they have places to deposit if you came by public transport. The entire trip is a walk thru – takes about 60 minutes. You cannot sit down on the grass or have a picnic – keep walking or stand for a few minutes to admire the beauty. There are restrooms , and water facility available at a few points along the trail. You start with the the large Herbal Garden which has every herb you can think of and then reach the Bonsai Garden. A few hundred Bonsai Plants on steps. You walk past a few shady Banyan Trees and then reach a musical fountain before entering the main garden. This is designed a bit like the Taj with two waterways with fountains along the centre. Extremely well maintained the Garden is a treat to watch. Well manicured gardens , flowers in every shape and colour its a treat for your eyes. You walk along the big rectangular patch of a green garden Trail that takes you very close to the Rashtrapati Bhavan and then make a turn. The photo below shows how close you can be to the Presidents House. As you head back past the Main Gardens you reach the Rose Gardens. You walk past a central walkway with rose gardens on both sides. The garden has more than 250 celebrated varieties of roses, which makes it one of the best Rose Gardens in the world. It has roses like Bonne Nuit, Oklahoma which are nearest to being black. In blues it has Paradise, Blue Moon, Lady X. We also have the rare green rose. The list is endless and the spectacle delightful. Just after the Rose Garden is another magical sight awaiting you – the sunk butterfly garden that is a riot of with a beautiful round sunk fountain in the centre. The walls of this sunk masterpiece are adorned with bright orange hanging flowers. The last stop is the Spiritual Garden which has every tree that is mentioned in the Spiritual books of all religions. Would have loved to sit here early morning and meditate but that was not to be. The Spiritual Garden is the last stop and then you head back to the exit. It took us 50 min – it was not empty and the Trail was full ( But not jammed) – I would say about 500 – 1000 people on a Friday late afternoon. Lots of Tourist buses and school kids. The splendour of places like this go up when its empty and calm and you can relax quietly ( Thats why I like the Badami Bag at Srinagar so much ) – but asking for this in New Delhi is high expectations. I am glad we could make it – Friends who have tried to come on a weekend have been disappointed with the massive crowds and have had to head back. Today is Feb 28th – you still have two weeks to try it and catch this Garden Visit in 2015 – so plan for it. 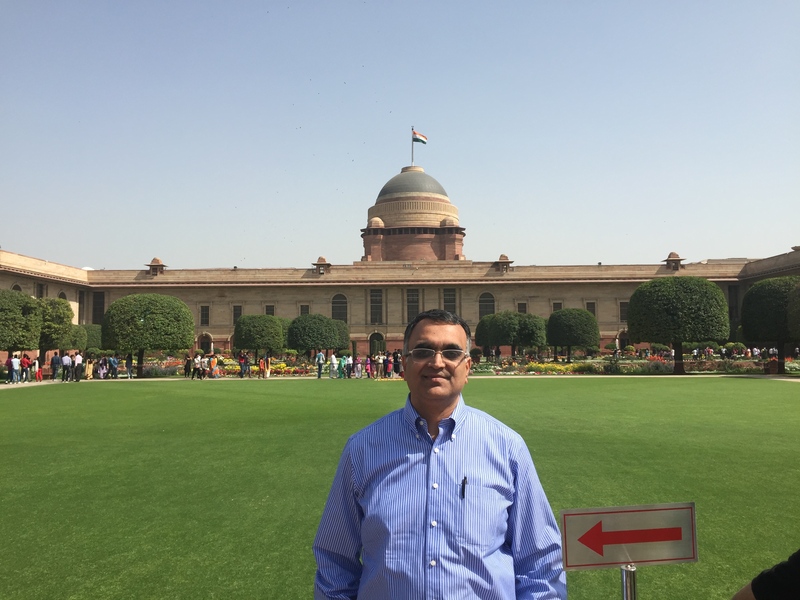 Understand that there is a way to get online registration and visit the Rashtrapati Bhawan interiors for a guided tour – thats next on my plan. can we go inside the rashtrapati bhavan????? ?